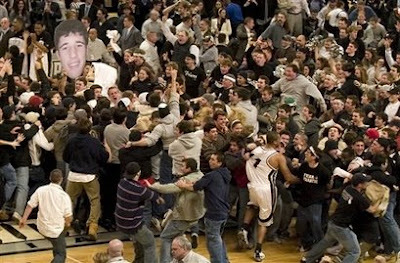 Great win for Providence, who up until now, wasn't even on the bubble. Given the fact they play in the Big East, and wins over Syracuse, Cincinnati twice and Pittsburgh, they actually have a case now. Well them, and about 25 other bubble teams. They beat URI and also lost to Northeastern. They still need 2 or 3 more wins. And for the record, they were definitely already on the bubble coming into today. I don't know who these announcers are, but the PbP guy set up his call real nice but the color guy absolutely ruined it by not shutting up. That's a great moment and a great piece of broadcasting (especially for lesserk known talent like we're dealing with here) if the analyst keeps his mouth shut once time expires. Great another team for all the Big Least media apologists to pimp for the Tourney. Last we thing we need is more Neandertahl Basketball.